I’m a newbie and having severe anxiety over the process of cutting paper. I’ve searched in this discussion forum many times (and on Ladies of Letterpress) and am surprised not to see many posts on cutting. I suppose that means it is not a common issue?! 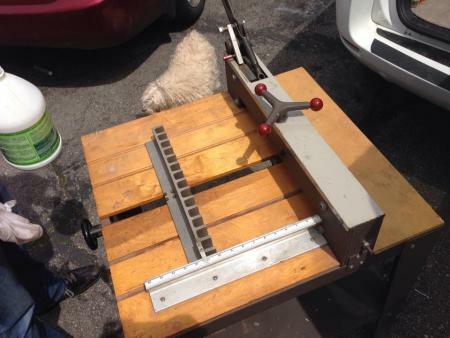 I just bought (at auction) a guillotine cutter, a Martin Yale 2502. 1) How are people cutting down big sheets and making sure they are square and/or ready to be fed into the press? 2) How are people then cropping down (post-press) on guillotines? When I use my guillotine, it is all kinds of crazy. First of all, let me say that I have read on threads the following and have tried them: (1) small stacks, (2) clamp hard, (3) use buffers. First of all, it is horrible at cutting anything squared right up against its guide. It just doesn’t have enough leverage? I have to bring the stack of paper away from the guide and just use my eyes to gauge. Secondly, sometimes the blade moves the paper, no matter how tight I have it clamped down. So then I often get a bunch that are not square. Thirdly, it is completely inconsistent. Sometimes, I think a quick, brisk pull-down will result in something clean. That sometimes work, sometimes doesn’t. I have pulled the lever down in increments, and amazingly, that seems to work better. Anyway, I am sure practice will help, thank you for any advice!!! Your small cutter will work well if you adjust it and work within its limitations. First you must have an extremely sharp blade and have it resharpened often. If the blade pulls the top of the stack away from the back gauge, it is dull and of course, you will get bad cuts. 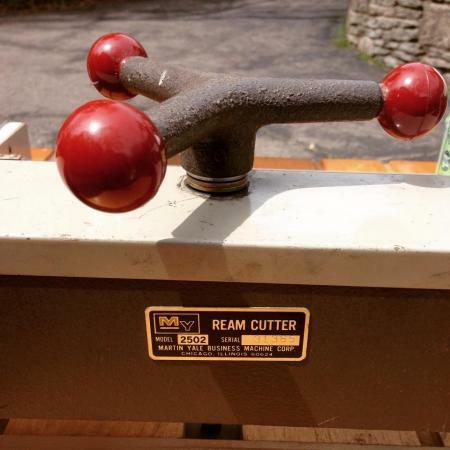 The manufacturer calls it a ream cutter. Try starting with smaller stacks. 25-50. More work. Better results. The back gauge must be exactly parallel to the blade. Look to find how it may be adjusted. Place several sheets of paper in the cutter and cut the long way to about 8”No need to be precise. On the side where the blade has cut, mark one corner A and the other B. With the back corners precisely matched, fold the paper corner A to corner B. They will fold precisely square only when the back gauge is precisely square. If either the A edge or the B edge is short, that will tell you which direction you must adjust the back gauge. One half the difference. My cutter ran out of adjustment. I have to shim between the pile and back gauge on one side. Very little, but necessary to get the square cut. Get the blade razor sharp. Be very careful to note exactly how the parts come apart to get the blade out so you can put it back together correctly. Use extreme care with the blade. Do not depend on the scale attached to the cutter. It may or may not be accurate. Mark one top sheet to the measurement you wish with a very sharp pencil. Then place it on the pile to be cut and bring the clamp almost down to touch the pile. Advance the back gauge to bring the pile forward to the edge of the clamp. Then raise the clamp and insert the scrap stock to protect the good stock. Clamp hard and cut. How are you cutting down sheets to fit into the guillotine and to create consistent results thereafter? I would suggest a paper cutter weighing 45 pounds, with what has to be a minimal blade, will not produce the precise results needed for accurate printing. It indeed is better than scissors, but not by much. It is a start, but it will not give consistent, satisfactory results even under ideal conditions. And I would bet the blade has never been sharpened. don’t feel discouraged - i’m a newbie and experience similar issues with my cutter! …going down fast sometimes works, sometimes not …less paper, more paper…its got a mind of its own!! i think i’m going to try sharpening the blade soon and see what comes of that….but for weddings, i’ll get the paper pre-cut and not take any chances! is there any difference in cutting cross the grain, or with the grain of the stock? if so, it may help to know this when you order your stock to begin with. Good to read basic tips on essential techniques like squaring paper and adjusting cutters.